This treat bowl is sweet and scary. Made from orange and black spiderweb fabric with creepy crawly spiders on the outside as well as eyelash yarn to add a little extra "cobweb" feel! The trick-or-treaters will love it! The perfect addition to any table! 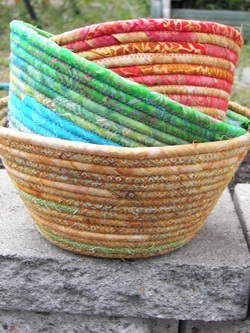 Made from fabric wrapped rope, these bowls are unbreakable and are perfect for storing just about anything. Keys, candy, hair accessories, TV remote, mail, and lots more! Availible in round or oval. Small, Medium and Large nest together and make great presents. Use any number of fabrics to customize to your taste. 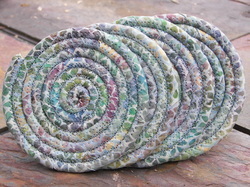 Fabric coasters make a wonderful housewarming gift and compliment any bowl.